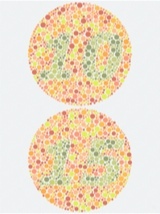 Color blindness or color vision deficiency is the decreased ability to perceive differences between some of the colors that others can distinguish. It is most often of genetic nature, but may also occur because of some eye, nerve, or brain damage, or exposure to certain chemicals. 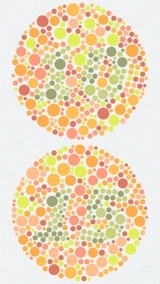 Color Blind Clock is a clock for your device (iPhone/iPad/iPod) that displays the current time like if it was an Ishihara test used to detect color blindness. Will you be able to see the time displayed in this clock ? 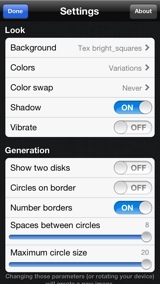 This applications contains a lot of settings, that will allow to customize the clock the exact way you want. From the size of the dots to the way they are organized, quite everything can be changed. 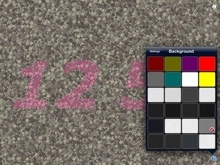 A lot of color palettes can be selected or created, from the ones of the Ishihara test plates to some others allowing to see the time very easily. 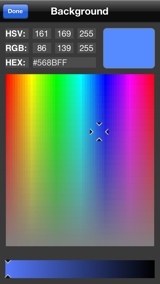 If you are color blind, you can select a color palette that finally gives you access to those tests that you almost never pass. 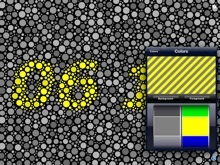 In case you choose to select the real colors used to detect color blindness, an help button can be pressed to reveal the hidden pattern. 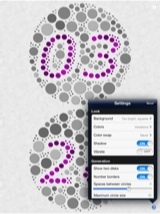 The displayed pattern can be animated, the small circles can visually vibrate and the colors can swap automatically. This can give a very psychedelic look to your own clock. 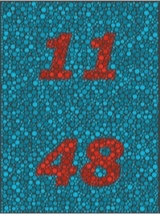 Touch the screen and the dots will react to your touches with a nice animation. This application is universal. Portrait and landscape orientations handled. 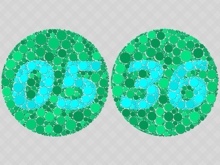 Note : Although not seeing the time (using the Ishihara colors) will indicate that you might be color blind, you should seek a professional for confirmation.